Update 5:54 pm – The French President Emmanuel Macron thanks the 500 firefighters who took part in the efforts to save Notre Dame Cathedral. Says that the “worst has been avoided” and that the cathedral will be rebuilt. Meanwhile the Paris prosecutor’s office has said that a preliminary investigation points to the fire being started by accident. Update 5:28 pm – French journalist Alexandre Fremont sends out this photo from a drone, showing the extent of the fire at Notre Dame. Update 5:03 pm – A French official reports that they believe the structure will be saved from total destruction. One firefighter has been seriously injured. 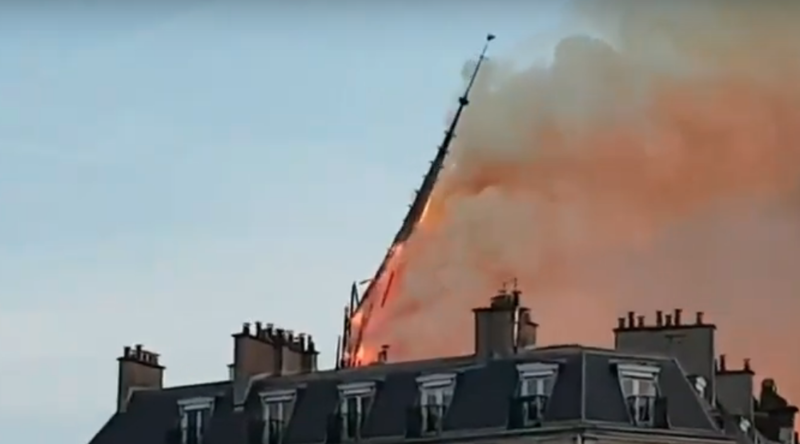 Update 4:06 – The Deputy Mayor of Paris, Christophe Girard, says in an interview that the fire started at 7 pm local time on the roof of the cathedral. Still too early to know what the cause of the fire was, but according to the local Bishop construction work was taking place. He adds that the fire may have started in the section where the statues were removed earlier this month. A plan to remove artworks was enacted with city hall, the Ministry of Culture and the Louvre all working together bringing trucks to take away the artefacts. About 1000 to 2000 residents have been evacuated, with city building and sports facilities being opened for them, but that local hotels are also offering space for people to stay tonight. Update 3:34 EST – French journalist reports that a priest from the Cathedral has told him that all the artwork and holy relics inside the church has been saved. For those asking why water is not being dumped from helicopter, etc. – firefighting officials say that dropping water like that would destroy the stone structure. Update 3:08 EST – Reports that the left-hand tower of the facade is now on fire. The restoration work at Notre Dame Cathedral was scheduled to last 20 years, and they needed 150 million euros to complete the work. This includes 2.5 million euros for the spire. Officials had previously reported difficulties in raising the funds. Earlier this month 16 copper statues were airlifted and moved for renovation. Update 2:48 EST – Message from the Mayor of Paris, Anne Hidalgo, asking people to stay away from the scene. Reports suggest the entire Île de la Cité has been evacuated. Update 2:40 EST – Live reports suggest that the fire is starting to be contained. Fire officials say that the renovation work being on the cathedral is being investigated as a possible cause of the blaze. Update 2:11 EST pm – Police report no deaths from the fire. The main spire has collapsed.